“In an age of electronic banking and online college degrees, why hasn’t the rest of the nation gone to voting on touchscreen computers? Since VOTING Machines are not tamper proof. Will its SOURCE CODE be made public ? Chief Election Commission ordered for draping Elephant (Including the raised trunk elephants which is not BSP symbol) during last UP elections along with SC/ST/OBC icons statues which were installed for historical reasons.After that several state assembly elections took place in several states. But why the CEC never bothered to order for draping of Hand symbol of Congress Lotus (National flower) of BJP symbol nor the statues of upper caste icons? it is of critical importance that we safeguard that most fundamental part of who we are as voters – our democracy – by ensuring voting systems work properly and that it is possible for those responsible for operating our elections to demonstrate to the public that their votes indeed are being captured and counted as they intended, and that the outcomes are correct. ideally, where the systems that tally our votes are checked to make sure they work as they should. This is where the intersection of technology and democracy occurs. Challenges to voters’ rights in that last yard derive from problems caused by the deployment and use of inadequate voting systems, and exacerbated by insufficient checks on the accuracy of the outcome. patently unfair that once you get to the ballot box, that the ballot itself fails you. Taken together, these problems threaten to silently disenfranchise voters, potentially in sufficient numbers to alter outcomes. We have seen strategically voters names being removed from the voters list in general and slums and villages where weaker sections reside.It is the duty of the EC to see that all the voters are included in the voters list as it is their fundamental right. It is requested that the above questions may be answered as a Right To Information. BJP symbol nor the statues of upper caste icons. particularly when paperless e-voting systems are used. University computer science professor David Dill and founder of Verified Voting Foundation, a nonpartisan election watchdog. Buchanan, claimed that 18,000 ballots went uncounted in the district. Without a paper trail to follow, the matter was left to the courts and Buchanan held onto the seat. against the numbers he finished with then you don’t have to trust him. How do you cast your ballot? the polling place, Dill says. indeed are being captured and counted as they intended, and that the outcomes are correct. 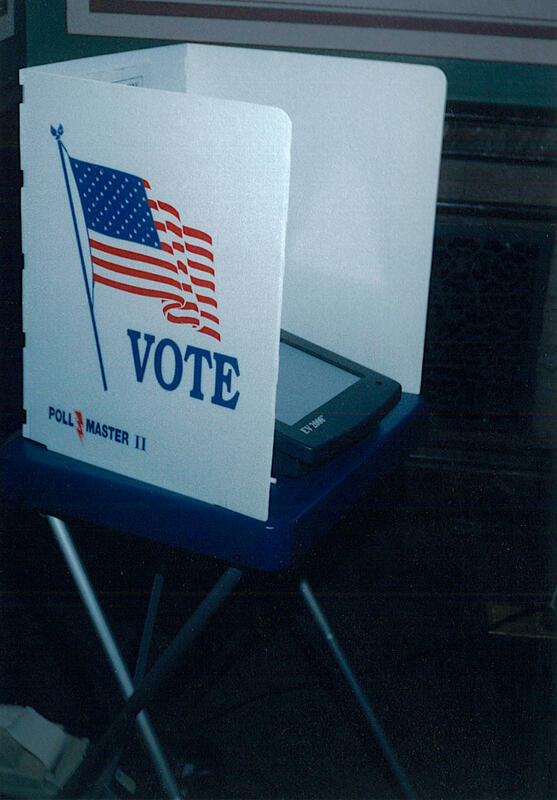 Four basic types of voting equipment are used in US elections. to allow for the possibility of write-in votes, though with older models this is still done manually. made available in the event of an audit or recount. mechanical lever voting machines are used in US elections. are relevant to hand counted paper ballots as well. accessible equipment for voters with disabilities. Most jurisdictions use different voting systems for these different voting stages. Polling Place Voting In American elections, the majority of votes are cast in polling places. that count paper ballots cast at polling places manually. days after election so their vote does not affect the calling of the states to different candidates. Once the provisional ballot is determined to be valid it is counted with a scanner or manually. recognize him if he came back was all that prevented a voter from voting again and again. maintain an independent tally of the votes, and since there is no ballot box, it cannot be stuffed. easily offer to pay a voter if he votes a certain way. for their own use. All other rights are reserved. 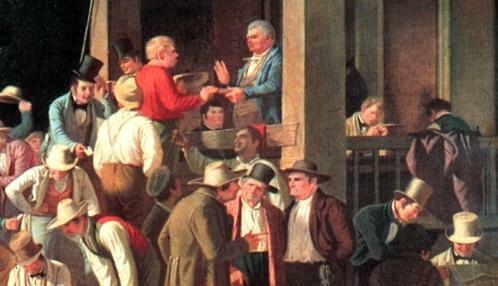 The conduct of elections has changed in many ways over the past 200 years. 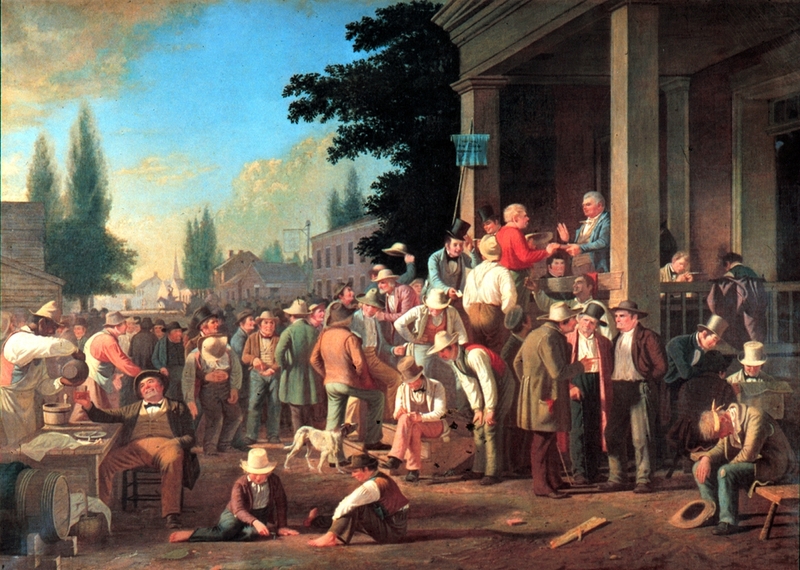 painting, The County Election (Figure 1). courthouse in Saline County, Missouri, in 1846.
came back was all that prevented a voter from voting again and again. were a common defense against clerical error. their own notes to the polling place. people can easily read off his name to vote for him. the pollbooks in his collection reflect this practice. Italian, ballota, and in fact, many early ballots were small balls. that they be round balls. for their exclusion in an upcoming vote. candidates in each of the many races races in an election. was in 1629 to select a pastor for the Salem Church. 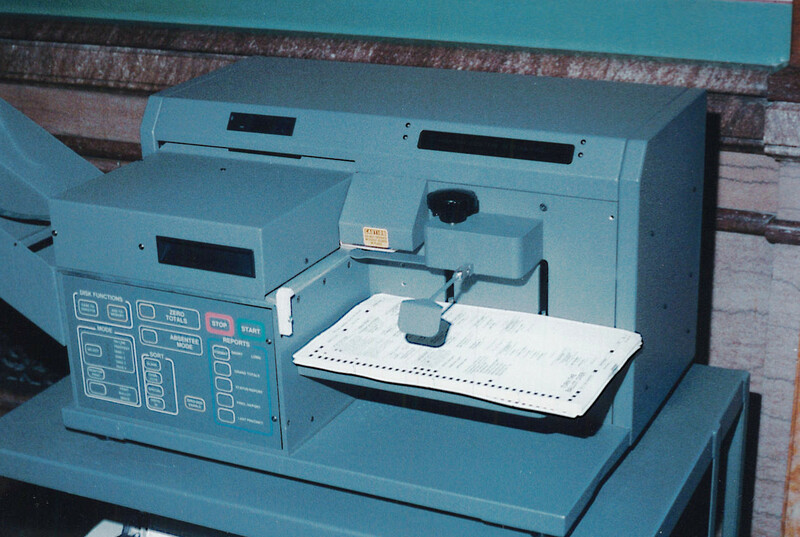 candidates or political parties began to provide preprinted ballots. the territorial house of representatives and various county offices. wrote this in at the very bottom. that no voter deposit more than one ballot in the box. ballot could be easily identified. resembled railroad tickets in size and printing style. in Figure 3 was printed by a local Republican party. 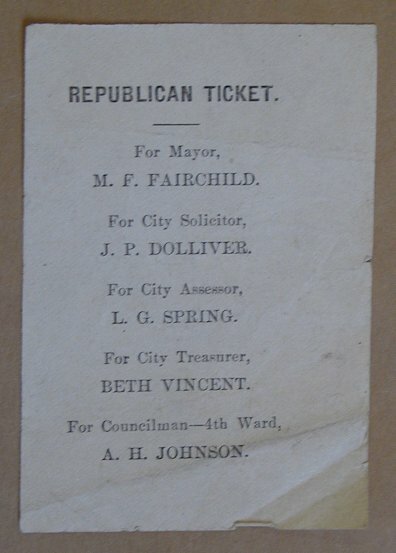 but the parties encouraged them to use the party ticket as a ballot. write in the names of the candidates he preferred. ticket will have no space left to write in the name of any other candidate. 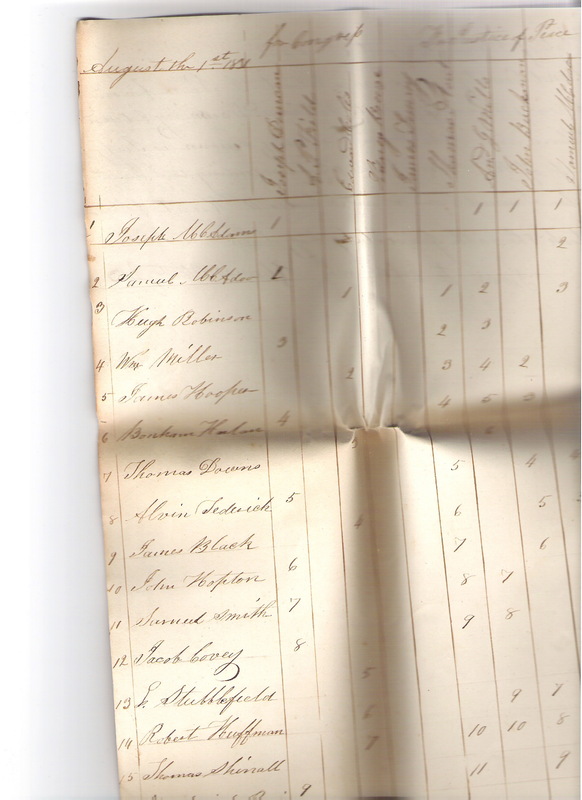 blank for county treasurer, where the party had no nominee. typography, below the ballot title, is deliberately difficult to read. ammounted to an invitation to strike-out names and write in alternatives. candidates, so the party name was always easy to pick out and read. impossible for a voter to hide the color of the ballot being deposited. addressed to the United Kingdom. edition of the People’s Charter. their ballot box design to Benjamin Jolly of 19 York Street, Bath. the judges would see two balls falling into the tray. later came to be seen as definitive. that replacing it with mechanical or electronic voting machines is unthinkable. secure ballot storage and transport. ward bosses simply announce the requested result. vote by marking an X in the box by an individual candidate name. Democratic primary in South Carolina. their changes in 1905 and 1909. 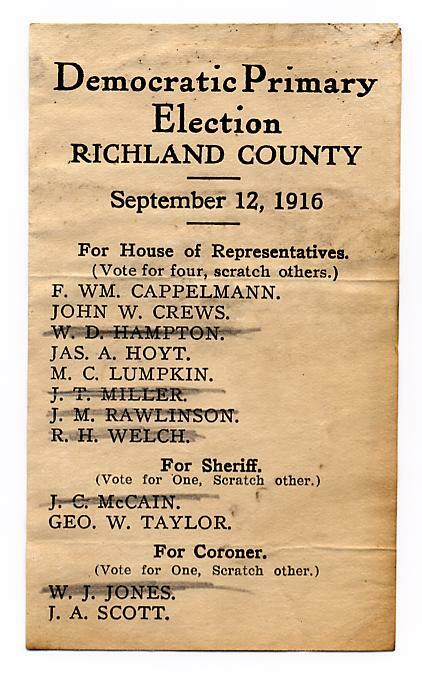 New Mexico finished a gradual migration from partisan ballots in 1927.
notably Arkansas. The example in Figure 6 illustrates this. voters could scratch out the names of the party nominees they did not support. more common mark-in-target rule, there are special voter education problems. lies in how votes are counted. the ballot count as votes. example of “an objective and uniform standard” that allows such a biased count. 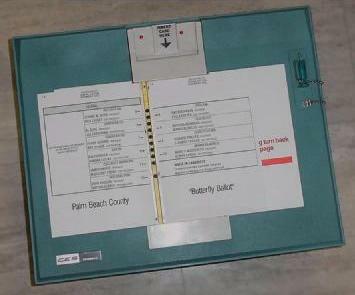 border of the box provided on the ballot. make on the ballot that express clear and obvious intent are disallowed. box may, under these rules, be discounted. played, it is likely that they will have already lost the election. the polls, a ballot box has been stuffed. counting can be a very expensive proposition. includes the right to equal and meaningful participation. advertising claimed that 12 million voters used their machines. 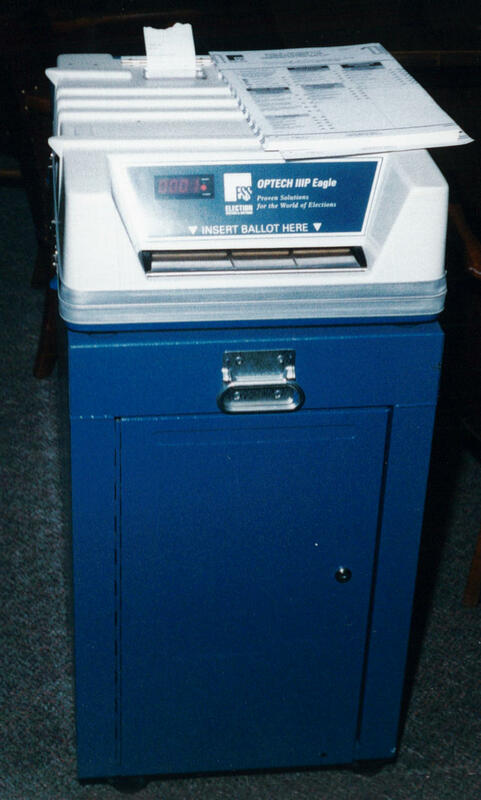 electronic voting machines in the 1990’s. descendant of Jacob H. Myers original company, organized in 1895.
be collapsed into a package that was relatively easy to transport and store. can easily be configured to handle a complex general election ballot. that was pulled down by the voter, and then it resets all the levers. machines offered what most voters considered excellent privacy. voting machine prior to every election would be prohibitively expensive. according to various possible answers to questions contained in the schedule. adopted for use in the 1890 census. Hollerith wasn’t working in a vacuum. 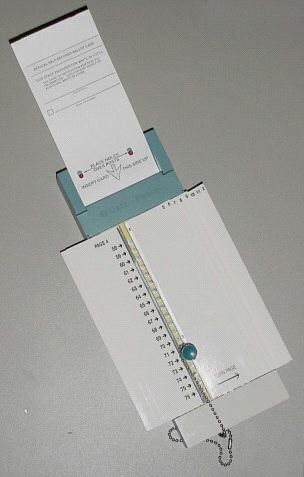 the punched cards used to control Jaquard looms. 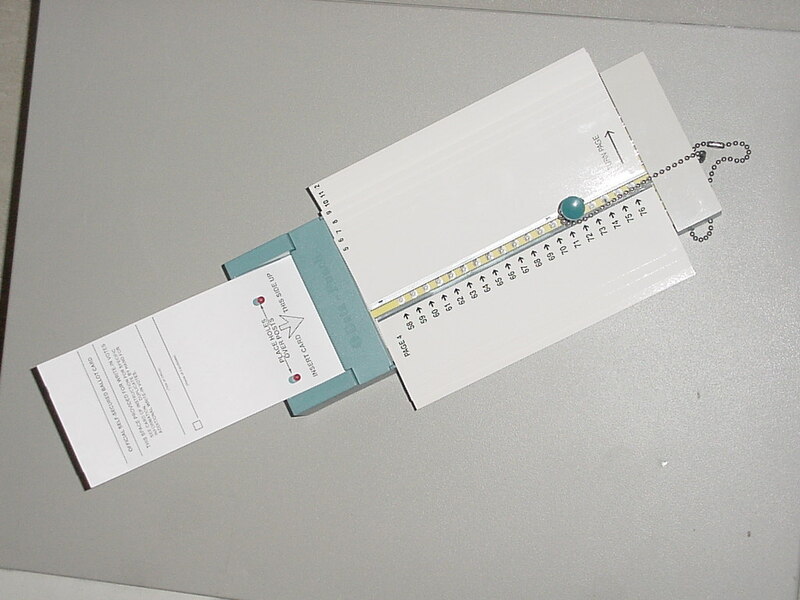 developed pre-scored punched cards and the Port-A-Punch card punch. patented them, and formed Harris Votomatic, Inc. to sell the result. looked promising enough that, in 1965, IBM bought the company. tabletop that can be used with their newer voting system. 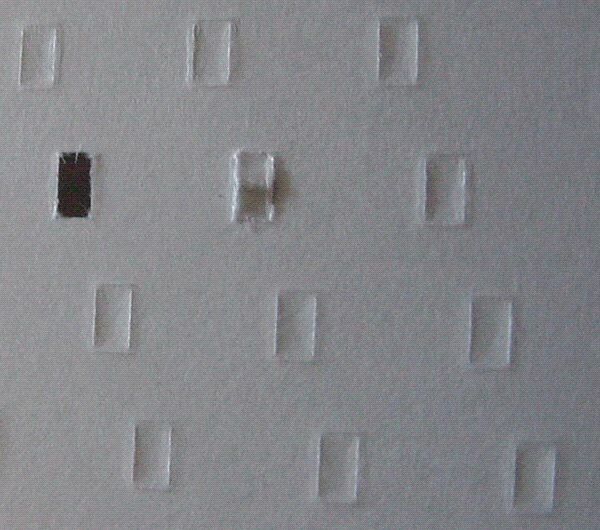 holes in the ballot stub that fit over pins at the top of the machine. IBM licencees. CESI was later absorbed into Election Systems and Software. by Election Data Corporation of St. Charles, Illinois. 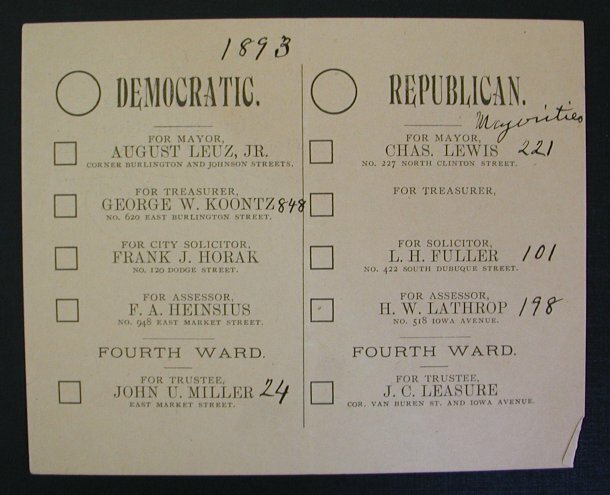 At the far end of the ballot stub is a small tear-off tab. reader or by an electromechanical punched-card tabulating machine. Problems with Votomatic technology have been known since the late 1960’s. other problems, but these reports were ignored by all but a few. development of chad jams that may prevent clean punching in those positions. had more than passing exposure to the problems of evaluating bits of chad. enough to create a clean punch while there was something obstructing the hole. less troublesome than the Votomatic. This is the DataVote system. each election, with the candidate names printed by each punching position. small fraction of all jurisdictions that have used it. Mark-sense scanning has its roots in the world of standardized testing. 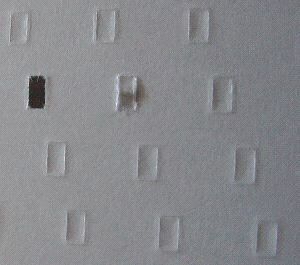 sensing graphite pencil marks on paper by their electrical conductivity. tests, most notably the SAT. This remained in use into the 1950’s. practical optical mark-sense test scoring machines in the mid 1950’s. experiments with using their mark-sense tabulators to scan ballots. 1958 and commercialized as the Coleman and later Gyrex Vote Tally System. also saw use in Oregon, Ohio and North Carolina. many California counties in 1968, and also approved for use in Ohio. 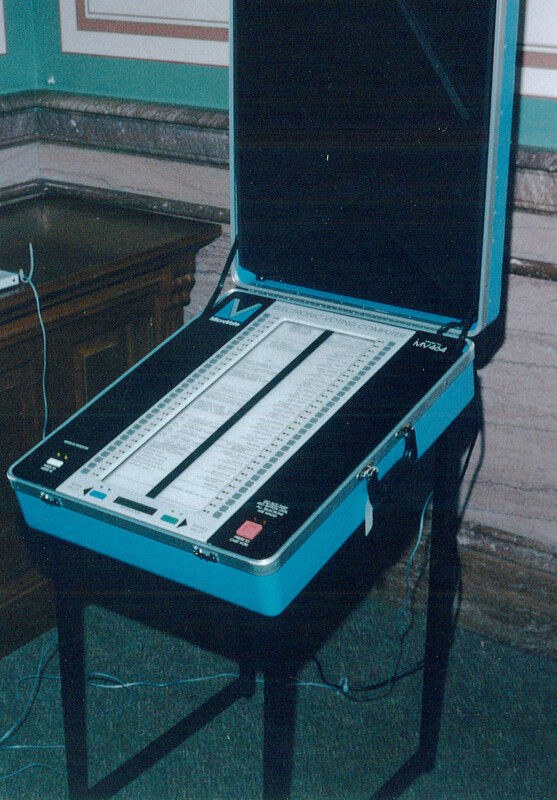 Corporation adsorbed the company in 1964.
vendor to sell reasonable numbers of mark-sense ballot tabulators. through the reader mechanism and ejected into the output tray on the left. it sits on a wheeled cart that also holds a printer and supplies. contains the scanner and electronics. by the precinct election workers or they are subject to a hand count. purchased the system and used it between 1976 and 1980, approximately. to be used in a real election. viewing, so the privacy is a bit better than the minimal booth suggests. displayed on the screen, black text on a white background. that is good for one use. to allow greater visibility during a demonstration of the machine. significantly more than this if the full ballot were to be displayed at once. department of the Iowa State Historical Society Library in Iowa City. Figure 4 is from the Larrabee papers. The digital images were made by the author. listed as a candidate on this ballot. by the author; those in Figures 9, 10 and 11 were made by Ted Herman. history of DRE voting systems. inventors.about.com offers an interesting history of voting. How secret is your Vote? is a useful survey of many related issues. at Lewis and Clark College. above facts and the aims of BSP to reach the people. under the age-old “Manuwadi Social System”. governments would remain dominated by the Manuwadi persons and parties. Today both the Congress and RSS’s BJP have secretly collided to-gether to deprive the Bahujan Samaj in acquiring the MASTER KEY as desired by Dr Ambedkar. Safeguarding elections in the digital age. its Constitution, made her its National President. farmers, traders and people engaged in other professions. opposed to the upper castes Hindus and other sections of the society. Also, the BSP has nothing to do with the issues of national interest. successive governments, had implemented all such promises. occasion, upper castes people were inducted in the Council of Ministers. i.e. Rajya Sabha and state Legislative Councils. interest of the country whenever the need arose. where equality is denied it has to be upheld and fought for. affairs as a matter of prime most priority. the fold of the Party. election symbol and “Blue” color as its flag.